“I don’t idolize nuclear energy at all. But I think you have to pick your battle. My priority in France, Europe and internationally is CO2 emissions and (global) warming” said President Macron in a TV interview on Sunday. He added that as such he would not follow Germany’s example by phasing out nuclear energy in France, because his priority was to cut carbon emissions and shut down polluting coal-fired production. Bravo, President Macron! Our open letter to him in July, signed by 45 eminent environmentalists and scientists, expressed alarm at his now-thankfully-reversed decision to move France away from clean nuclear power. Few nations have done more than France to demonstrate the humanitarian and environmental benefits of creating a high-energy, nuclear-powered electrified society. Few leaders have had the courage to take climate seriously enough to say that nuclear is needed as well as renewables. Energy for Humanity’s European Climate Leadership Report shows that away from the hot air, those countries with a combination of nuclear and renewables are the real climate leaders. France has one of the cheapest and cleanest electricity grids in Europe. By contrast, anti-nuclear Germany has some of the most expensive and dirtiest. Germany spent nearly €24bn above market price in 2016 for its renewable energy production feed-in tariffs alone, but emissions have remained stagnant. The country is now set to miss its 2020 emission reduction goals by a wide margin. Meanwhile, UK leadership in Europe still matters (Brexit be damned). The UK matters because it is the other big carbon polluter in Europe. However, our report shows that the UK made the largest absolute reduction in greenhouse gas emissions between 2010-2015. This is partly due to a shift from coal to gas, and partly due to new renewable capacity, combined with the existing nuclear fleet. Solar and wind can also play an important role in France. However, if France is to make investments in solar and wind, they should follow the UK example, rather than Germany’s and ensure they increase France’s share of clean energy, not reduce it. Renewables can contribute to the further electrification of the transportation sector, which France has already done with its trains and should continue to do with personal vehicles. At last week’s One Planet Summit, the World Bank also hinted that it is finally catching up with some 21st century climate realism (you know, about the clear and present danger that continuing to burn fossil fuels will irreversibly destabilise the Earth’s operating system, causing severe harm to humans and nature). So, the good news is that the World Bank will no longer fund upstream oil and gas projects and will start reporting greenhouse gas emissions from the investment projects it finances in key emissions-producing sectors, such as energy, starting next year. But the bad news is that the Bank remains inexplicably retrograde by arbitrarily excluding the world’s second largest source of carbon free power from accessing funds. This is despite nuclear having a carbon footprint equivalent to wind, and being considered by every credible scientific study as critical in our efforts to combat climate change. Ideological hangovers like this seriously hinder the already near impossible task of replacing the world’s entire fossil fuel infrastructure within a few decades. Trying to do this without nuclear energy simply loads the dice towards failure. Sure, nuclear has issues, but these should be considered within the full context of catastrophic runaway climate change, air pollution, and energy access requirements. So, like Macron the battle I choose is against climate change and poverty and air pollution. This is surely the battle the World Bank ought to be fighting, and others too, such as the United Nations Environment Programme, which vetoed nuclear from their conference at COP23 because they “prioritise the renewables revolution, such as wind and solar energy”. 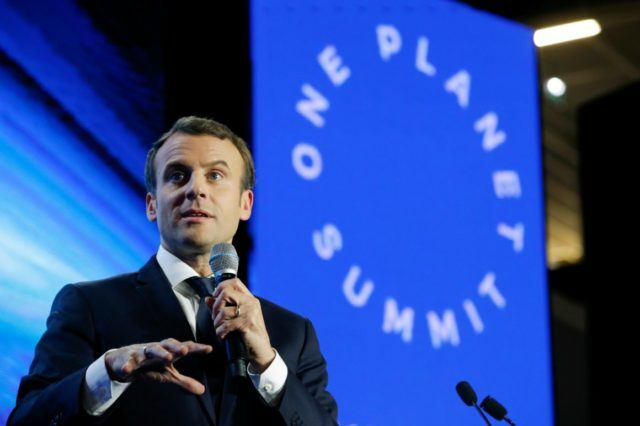 By choosing the new battle against climate change over the old battle against nuclear, President Macron has shown us what climate leadership looks like. It took courage to break the nuclear taboo. Why does it matter? Because to solve climate change we need more climate realism. You can find out more about Energy for Humanity’s new simple metrics for measuring climate leadership in our European Climate Leadership Report.